Free shipping. Buy direct from HP. 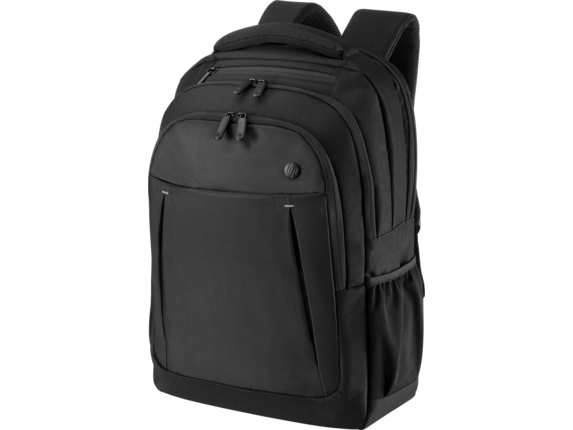 See customer reviews and comparisons for the HP 17.3 Business Backpack. Upgrades and savings on select products. Keep your hands free and your notebook safe with the HP 17.3 Business Backpack, designed to go with you in and out of the office and on the road. It has lockable1 zippers, a secure RFID pocket, and room for your device up to 17.3" diagonal, phone, accessories, and so much more. Put a buffer between your personal information and electronic pickpockets with an RFID pocket that helps protect the data encoded on credit cards and passports. Deter tampering and access to your notebook with double-coil, lockable  zippers. Pack it all in and stay organized with a dedicated, padded notebook compartment and plenty of slip and zip pockets for all your accessories. Wear the bag over your shoulders to keep your hands free, or carry by hand with the top handle. Commuting and traveling are easier than ever with a luggage pass-through that fits over the handle of most rolling suitcases. Put a buffer between your personal information and electronic pickpockets with an RFID pocket that helps protect the data encoded on credit cards and passports. Deter tampering and access to your notebook with double-coil, lockable zippers.